Detective Diego Montel is determined (obsessed, his partner would say) to catch the culprit behind a series of city-wide break-ins. 1. There’s no evidence of the break-ins actually taking place. 2. The culprit isn’t stealing anything. He (or she) is leaving things behind—books. 3. Diego’s boss wants him to stop wasting time and departmental resources on what might not be criminal activity at all. None of that will deter him, though. And neither will Diego’s partner (whose beautiful brown eyes are more than a bit distracting), who thinks the whole thing is kind of funny. 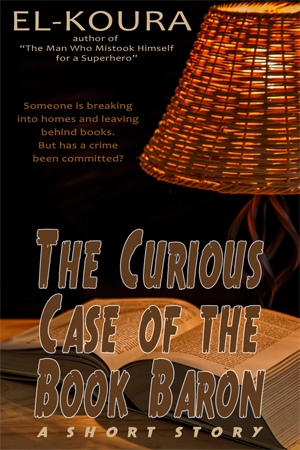 Diego won’t stop until he unravels the strange mystery surrounding the criminal figure people are calling the Book Baron.